Home Watch Types Automatic Origin Watch Co. Vintage Field asks: Shinola who? Anyone wowed by Shinola’s tale of American resurgence should be doubly impressed by Origin Watch Co.’s more refined take on what an affordable American watch can be. Like Shinola, these watches are assembled from foreign parts in the American heartland. But unlike Shinola, the star of the show here is a highly detailed mechanical movement. The dial, hands, and case of the Origin Watch Co. Vintage Field are also head and shoulders above most anything coming out of Detroit. The Vintage Field is not perfect, but it is among the best American-assembled mechanical watches at this price-point. 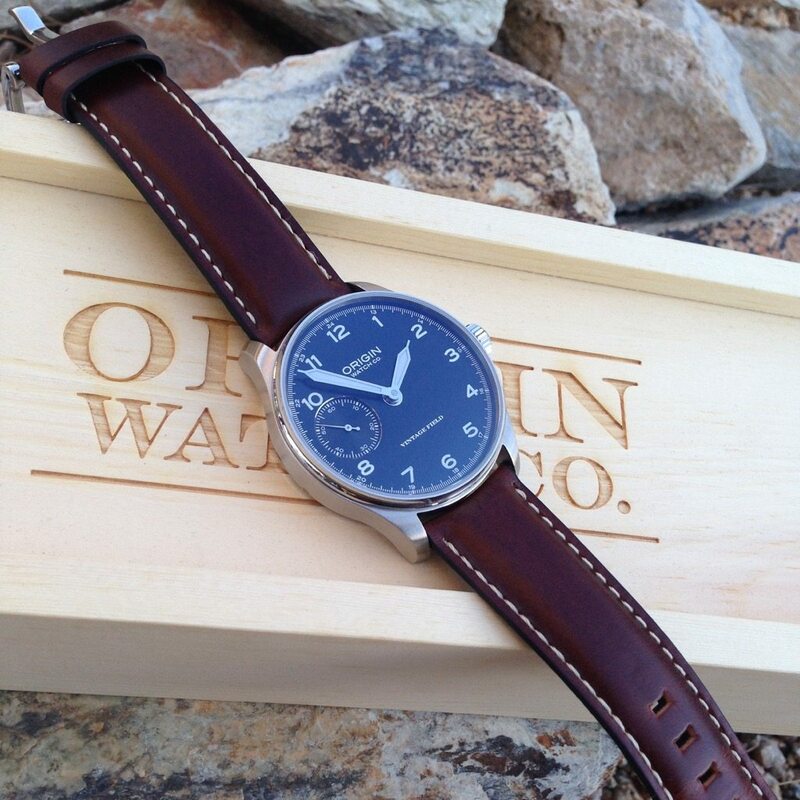 Origin Watch Co. labels its Vintage Field watch as such on the dial, but the design speaks much louder than the words. This is unmistakably a field watch, with big Arabic numerals at the hours, broadsword hands, and a 24-hour register tucked in among the minute register. Its classic styling is itself vintage, but the small second sub dial is also old school—as is the hand-wound pocket watch movement. The whole package is a stylish example of the American watchmaking resurgence—foreign parts, assembled domestically, at a very reasonable price. A Sea-Gull ST3600 movement keeps the price down, based on the ETA 6497 that is still being made in Switzerland. Origin Watch Co. offered the Swiss movement as an option in their earlier field watch, but this second iteration is all Asian. They report good experience with the quality and reliability of the Chinese movements, which they calibrate to within +/- 12 seconds per day in their Tennessee workshop. Any perceived trade-off in prestige or precision is offset by the beautiful decoration visible through the huge sapphire case back. Every bit of the movement is gussied up, from the Genève-striped bridges to the blued screws to the sunburst on the crown and ratchet wheels. All those mechanical flourishes are especially appreciated since this is a manual, with no rotor to hide the show. The big pallet fork is loud—ticking away at 21,600 beats/hour so forcefully that I could hear it with my hand on the steering wheel of my car. The second wheel is visible under the bridge, gliding along with the second hand that sits exactly opposite it on the dial. It’s a neat visual connection between movement and dial. That sub second dial at 9:00 got lots of design attention. The field is snailed. The lip is polished. The register is sharply printed. The second hand is counterbalanced and perfectly sized to just graze the register. The rest of the dial is no-nonsense, with ample lume where it counts and balanced text at 12:00 and 6:00. The case is a three-part deal, with a stepped and polished bezel on top, a brushed mid case, and a polished case back. The whole thing needs to be big to accommodate the pocket watch movement, and big it is. The wide-open dial and simple bezel make the watch look every bit of its 42mm. The sharply sloping lugs keep the 50mm lug-to-lug distance manageable, even on my 7” wrist. Those lugs are 22mm across, filled in with curved spring bars on a thick custom leather strap that carries a squared buckle with the Origin Watch Co. logo. The strap has a subtle vintage look out of the box, which should only improve with wear. The most dramatic dimension is the beefy 14mm height, which looks giant at first but on the wrist it seems only just barely too bulky for its own good. Shaving a few millimeters on the case height would make things more proportionate. Alternatively, a larger crown would help with proportionality. The 7mm pull out crown is too small to comfortably wind the beefy mainspring, and wind it you must to keep the 40-hour power reserve full. If the case is going to be so tall, there is no reason the crown shouldn’t grow too. Who’s it for? Your nationalism may only be skin deep, but you still won’t settle for a quartz movement. Would I wear it? It’s just shy of perfect, but the value proposition is there. What I’d change? A bigger crown or a slimmer case. Or both. Standout feature? Beauty of a movement with a questionable provenance. Tech Specs from Origin Watch Co. Previous articleLord Henry, oh where have you gone? Why, I’m on your wrist, fair lad! It’d probably be better to ask “Weiss who?” moreso than Shinola? Considering this looks strikingly similar to their first timepiece. Right, John, I immediately thought of the Weiss. Clearly a nearly copied design. Why are there marks between the minutes? Origen is a terrible name. 14mm is way too thick. Engrave something on the movement. Don’t write on the glass back. 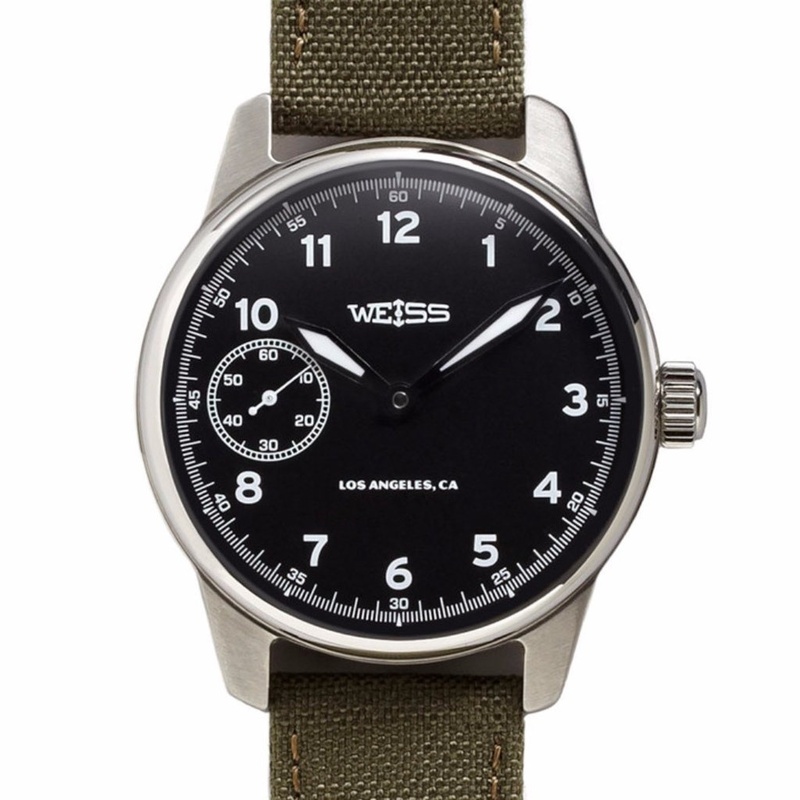 Yeah, this thing screams Weiss, but there’s not a lot you can do with the “Unitas based field watch” motif. That said, I do kinda like the dial and hands better on the Origin than the Weiss. I most certainly like the price better than Weiss. Of course the Weiss movement is fully made, finished and assembled in-house as opposed to the Origin’s Seagull movement which comes finished in the box from China. You just have to decide what you want to pay for. what would Weiss think about this one uh?? nothing new here… $500 really??? the movement alone costs $40, don’t get me wrong it is in fact a very good and nice movement but common! we all know you can buy the movement directly from tenths of trusty China based ebay stores… this watch should cost the half.. $250 is a fair price for a Weiss copy case+dial and a Chinese ETA clone movement inside.